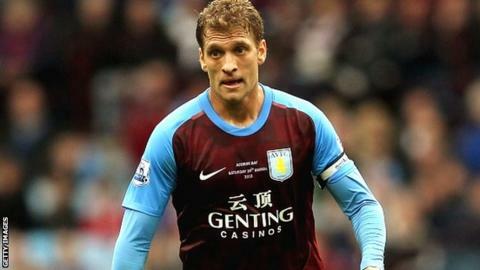 Aston Villa captain Stiliyan Petrov has been diagnosed with acute leukaemia, the West Midlands club have announced. The condition was diagnosed following tests after the Bulgaria international, 32, developed a fever following Saturday's 3-0 defeat at Arsenal. "He will get from Villa every ounce of love and support that we have, to help bring this to a positive conclusion," Villa said. Leukaemia is cancer of the white blood cells. Symptoms include pale skin, tiredness, breathlessness and susceptibility to infection. Acute leukaemia means the condition progresses aggressively and needs immediate treatment. It is understood Petrov will begin treatment in London on Monday. In the meantime the former Celtic midfielder is being seen by medical specialists. "We expect to learn more about the situation in due course," a club statement continued. "During this time we ask that Stiliyan's privacy is placed ahead of all inquiries and trust that we will share information as we receive it." Petrov joined Villa from Celtic for £6.5m in 2006 and has scored 12 goals in 219 appearances. He played the full 90 minutes at Emirates Stadium on Saturday, his 30th game of the season, but on the bus after the match he reported to a doctor that he felt unwell. Aston Villa indicated on Wednesday that Petrov was feeling the effects of a virus, but news he was suffering from leukaemia was only confirmed earlier on Friday after medical tests. Aston Villa manager Alex McLeish said Petrov was feeling "defiant" and was concerned about his loved ones. "He's a captain, he's a leader, he's a defiant guy and he's fought many battles on the pitch and I'm sure this is another one he'll win," he said. McLeish added he was unsure whether Petrov would be able to attend Saturday's home clash with Chelsea. "He's away with the doc today and I'm not sure of the schedule. He's away to see another top specialist as we speak and I guess we'll know more tomorrow." Of the other Villa players, McLeish added: "They are gutted but galvanised to try to win the game tomorrow for their captain." Meanwhile a section of Villa fans have cancelled a planned protest before Saturday's game and McLeish called for fans to be "united". Villa chairman Randy Lerner said on the club's official website that Petrov was "cherished by many people throughout football." "Such was his determination to learn English however that he took to working in a friend's burger van as a way to pick up the language and his fortunes turned as O'Neill deployed him in his more familiar central midfield role." "We are relying on the very decent and experienced people in and around the club for support, guidance and leadership," he said. Villa chief executive Paul Faulkner added: "I was completely stunned to hear this news about Stiliyan. After our game last weekend we initially thought that he was suffering from a virus and, like the true leader and consummate professional that he is, he had simply played through it." Jonathan Fear of the Vital Villa website said: "There is absolute shock amongst the Villa fans, and the outpouring of love and admiration for Stiliyan increases by the minute. "Villa fans will show that they care about him during tomorrow's game. "When the chips are down, Villa is a family and Stiliyan is a large part of that." Celtic manager Neil Lennon, a friend and former team-mate of Petrov, tweeted he was "absolutely inconsolable". "He will overcome this like all the other barriers he faced in his life. "Stiliyan has the heart of a lion and as part of the Celtic family he deserves all our best wishes and support." Signed for Aston Villa in August 2006 in a £6.5m move from Celtic, becoming then-boss Martin O'Neill's first buy at the club. Has since made 219 appearances for the club, scoring 12 goals. Made captain in the 2009-10 campaign, leading the team out at Wembley twice. During his time at Parkhead he made 288 appearances, scoring 64 goals, winning four Scottish titles. Has won more than 100 caps for Bulgaria. Celtic chief executive Peter Lawwell added Petrov had been one of the club's most popular players: "This is terrible news and our support and prayers go to Stiliyan, Paulina and their family at this very difficult time. "Stiliyan was an exceptional player for Celtic and helped to bring incredible success here during the seven years he spent at the club." Former England midfielder Geoff Thomas, who was diagnosed with leukaemia in 2003, told the BBC that what happened in the next few days would be important for Petrov: "This country is a leading light when it comes to research into blood cancers. "He's a fit young man and everyone will give him the best chance and put him on road to recovery as soon as possible." Professional Footballers' Association chief executive Gordon Taylor told BBC Sport: "It's just terrible news. I've just written to him offering our support and help. Our thoughts and prayers are with him. We've got our fingers crossed he'll pull through." Aston Villa goalkeeper Shay Given: "In shock about Stiliyan Petrov acute leukaemia but we are all here for him and his family. Please God he makes a full recovery #prayforstan." Aston Villa striker Darren Bent: "Really sad news to hear about our captain Stan Petrov. Hopefully he'll be back fighting fit soon. Thoughts are with him and his family. KTF." Aston Villa midfielder Gary Gardner: "Please God, make Stan be OK. He's our skipper and such a nice man. Praying for you mate - thoughts are with you and your family." Aston Villa goalkeeper Brad Guzan: "Gutted to hear the news about Stan. Thoughts and prayers to him and his family. Stay strong pal!" Aston Villa defender Carlos Cuellar: "I feel very sad with the news of our captain Petrov. Our support for him and his family. He is very strong and will win this battle. We are all with you my friend. #prayforstan." Tottenham midfielder Jermaine Jenas: "Just saw the news about Stan Petrov one of the nicest guys in football! Thoughts with him and his lovely family." Match of the Day presenter Gary Lineker: "Terribly sad to hear that Stiliyan Petrov has been diagnosed with leukaemia. Thoughts are with him and his family. All cases of Leukaemia vary, but from personal experience with @GeorgeLineker we know it can be beaten #goodluckStiliyan." Former Villa midfielder Ian Taylor: "Terrible news re Stiliyan Petrov illness. Our best wishes go out to him and his family. Praying he can make a full recovery #getwellstiliyan." Bolton midfielder Fabrice Muamba's fiancee, Shauna Magunda: "Get well soon Petrov. We'll be keeping you in our prayers."